After violently murdering his mother and her lover, Patrick (Robert Thompson) lays comatose in a private hospital. 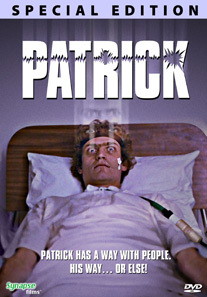 When a pretty young nurse (Susan Penhaligon) begins working at the hospital, Patrick tries communicating with her, while others in her life are being hurt and killed in mysterious ways. PATRICK is a classic supernatural thriller from Australia. Directed with amazing style by Richard Franklin (F/X 2, PSYCHO II), this unsettling film of telekinetic terror “…would give CARRIE a run for her money.” (Ivan Hutchinson, TV GUIDE). This DVD contains a totally new, re-mastered transfer of the original uncut Australian version in anamorphic widescreen and digital sound.